7 to 10 working days from approved artwork (weekends and public holiday not included). Additional options added to product may extend this time, Allow an extra 1-2 working days for an option. Static material clings to almost any smooth surface with no adhesive and can be easily removed. There is no adhesive residue to clean up. 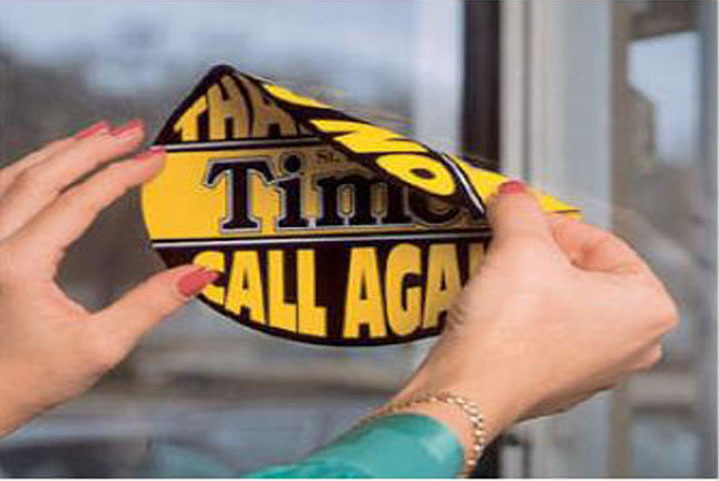 Static cling stickers are great to use as inside window stickers, we support stickers, temporary stickers, parking permits, short term advertising along with many other applications. Choose from Clear or White Static Vinyl. These come with static adhesive and are not inteneded for long term outdoor use. Supplied as cut singles. Printed with UV Resistant Ink for Fade Resistance. White static cling with face adhesive is avialable please request a quote. It is not necessary but is recommended that any ink on clear material should be backed up with white ink to limit transparency. White ink is priced as an additional ink color. Static Cling is a non-adhesive label that will stick on a glass surface without adhesive. It can be removed and reapplied. We accept both PC and Mac files. We accept Illustrator, Photoshop, InDesign, Corel Draw, and Quark files along with .PDF, .EPS, .JPG, .TIF, .PNG, and WMF. We prefer vector artwork files. Convert all text to outlines, paths or curves. If non vector artwork is submitted we prefer at least 300 dpi files. Artwork can be submitted for verification. I need labels for my specific application but don't know what I need- Can you help? No problem - we can help. We have assisted many in this position. Just let us know what the labels will be applied to, how they will be used and the environment they will be used in and we will recommend and quote a particular label for you. We can also send samples for testing. Is there a difference between labels and stickers? -No, a label and a sticker are the same thing, just a different terminology. Will I see a copy of my order before it prints? -Yes, all orders will be proofed prior to printing. We can email you a pdf file of your order. What if my labels are printed incorrectly? If our mistake - we'll do the labels at no charge. If your error - we'll work something out. Label cost is determined by quantity, size, material, ink colors and any special features like embossing, laminating or numbering. Are your labels self-adhesive?" "Are your labels sticky?" "Are your labels peel and stick?" All of our products referred to as a "sticker" have an adhesive back. All adhesive stickers have permanent adhesive except for the products referred to as "removable" labels. Removable stickers have a removable adhesive allowing you to remove the label and reposition it as needed. All products referred to as "hang tags" are non-adhesive. Do you think these labels will stick to glass, plastic, wood, drywall, fabric, metal, paper, or baggies? We have tested all of our label sheet materials with favorable results on a variety of surfaces. However, we always suggest ordering a few sheets first to do your own testing before placing orders for large quantities. 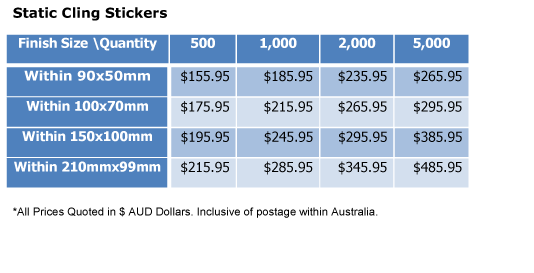 You may order as little as one sheet of a size and material so that you may do your own testing.